Warm up your friends and family from the inside out with these 5 Easy Slow Cooker Soup Recipes to feed a crowd! Keep your entertaining efforts low key this time of year with a make-ahead slow cooker soup buffet! 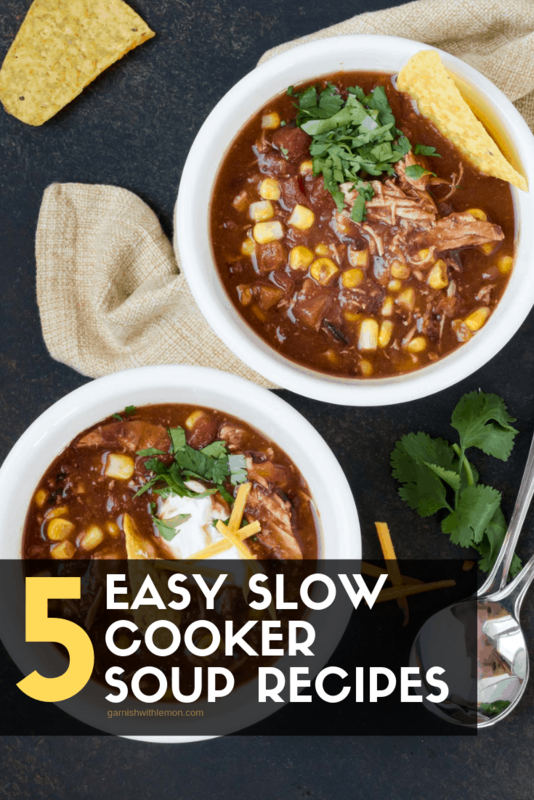 This collection of 5 Easy Slow Cooker Soup Recipes is a perfect way to serve a crowd during chilly weather. 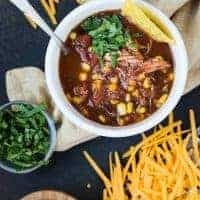 You can even make these slow cooker soup recipes ahead of time and freeze them until the day of your party. Or just make a single recipe and enjoy easy meals all week long. 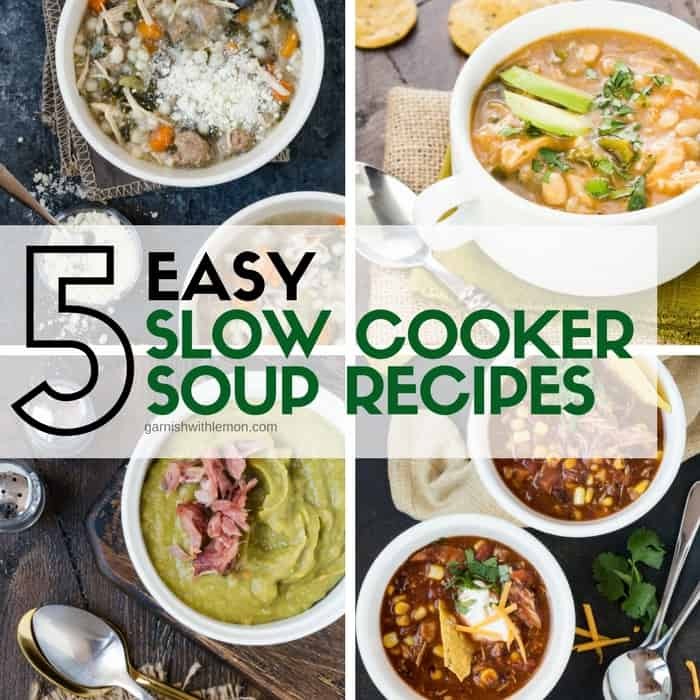 Whatever route you choose, you can’t go wrong with any of these 5 Easy Slow Cooker Soup Recipes. 1. 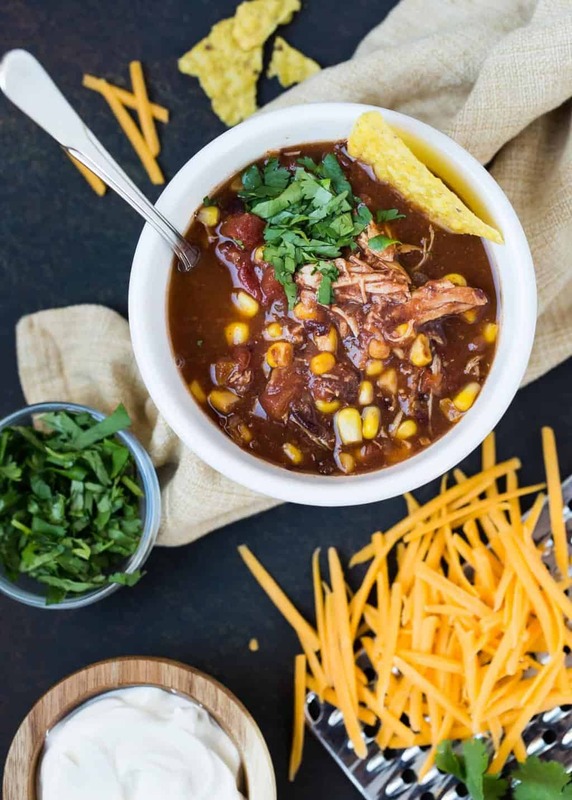 Tacos are always a crowd-pleaser, so this Slow Cooker Chicken Taco Soup is bound to be a huge hit. Filled with classic taco ingredients like chicken, cheese, refried beans and corn, the real flavor punch comes from an unsuspecting soup ingredient: a bottle of your favorite beer. 2. Any chicken noodle soup lovers out there? 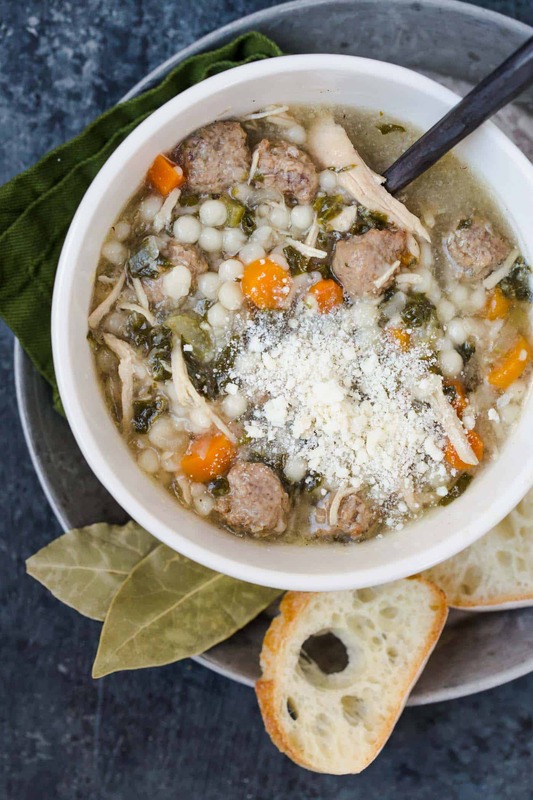 Then this Slow Cooker Italian Wedding Soup is for you. 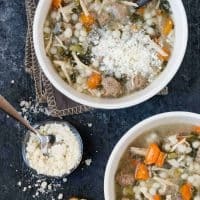 The addition of mini-meatballs and pearl (or Israeli) couscous gives a new twist to a familiar, comforting soup that is chock full of the usual suspects like chicken, celery and carrots. 3. 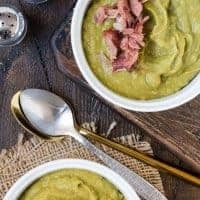 Though Slow Cooker Split Pea Soup may not have the splashy appeal of other soups, it definitely has raving fans (count us among them). This dump and go slow cooker version of split pea soup is pure comfort food – perfect for chilly nights. 4. 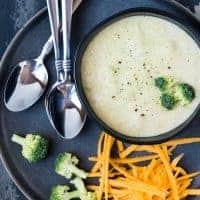 No soup buffet is complete without a Slow Cooker Broccoli Cheese Soup. It’s always a popular choice for a crowd. Puree the soup more or less depending on how chunky or smooth you prefer your soup (we’re in camp creamy). 5. 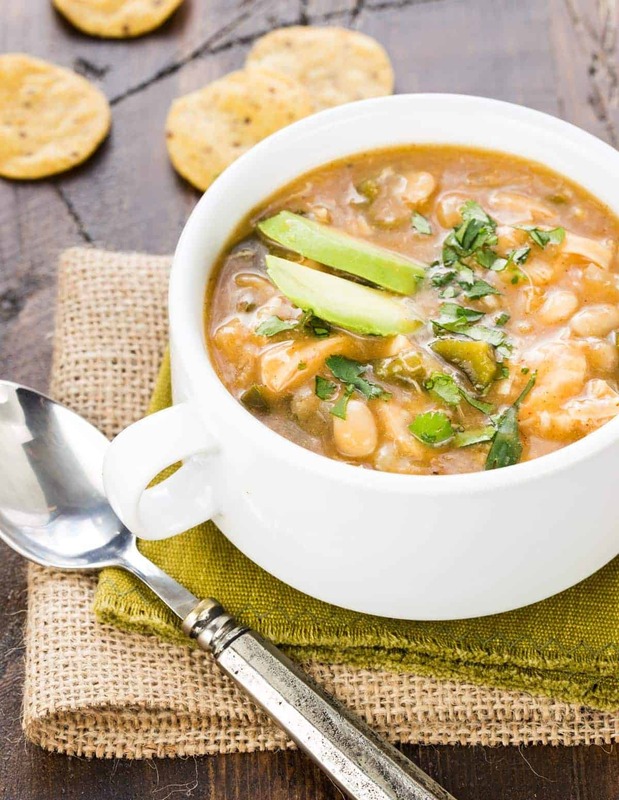 If you’ve never tried a white chili recipe before, our flavorful Slow Cooker White Chicken Chili version is a must-make. Use a rotisserie chicken to keep cooking time to a minimum and enjoy a bowl of this hearty goodness in as little as 5 hours! 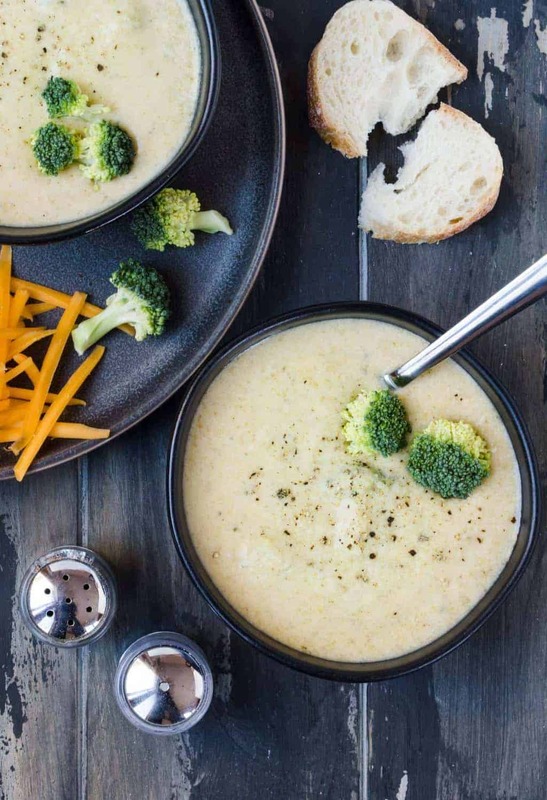 Warm up your friends and family from the inside out with these 5 Easy Slow Cooker Soup recipes. This easy soup is filled with mini meatballs and will satisfy any chicken noodle soup craving. 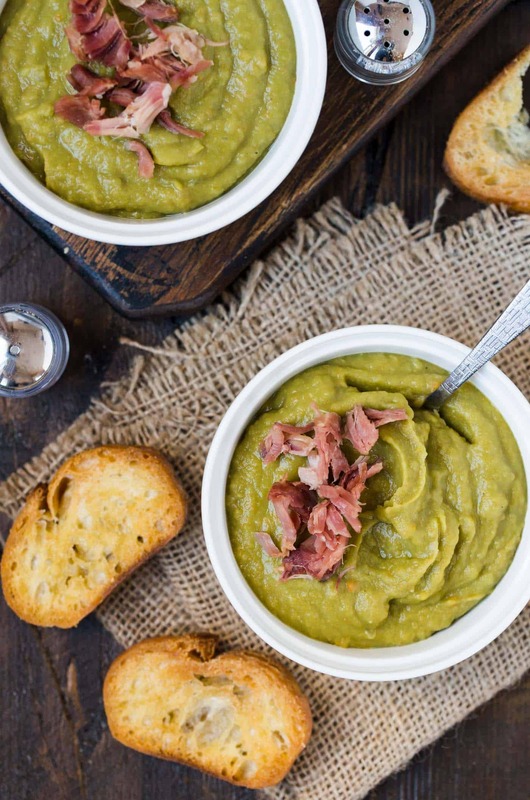 This dump and go version of Split Pea Soup with Ham will quickly become a favorite! This easy version of a favorite can be made chunky or smooth depending on your preference. 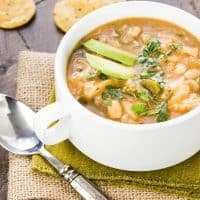 If you have never tried white chili before this Slow Cooker White Chicken Chili is a must-make.